Concrete doesn't face the same challenges of other materials. It doesn't burn, rot, or rust and can withstand even harsh environments. Low maintenance, sound insulating, and a material that provides maximized energy efficiency via thermal mass, the efficiency of concrete also equals money savings. Concrete mixes can be developed to suit all conditions and building specifications in addition to aesthetic preferences like colour, patterns, and shapes. It's recyclable, boasts a low carbon footprint over its lifecycle, and has no off-gassing. Words like cement and concrete often are used interchangeably but they are different. Cement is actually an ingredient of concrete. Concrete is basically a mixture of aggregates and paste. The aggregates are sand and gravel or crushed stone; the paste is water and portland cement. A unique quality of concrete is that it gets stronger as it gets older. Portland cement is not a brand name, but the generic term for the type of cement used in virtually all concrete, just as stainless is a type of steel and sterling a type of silver. Cement normally comprises from 10 to 15 percent of the concrete mix, by volume. Through a process called hydration, the cement and water harden and bind the aggregates into a rock-like mass. In its most basic form, concrete is made from cement, water, and aggregates or rocks. Most concrete today is also comprised of supplementary cementing materials and chemical admixtures. *Please consult CSA A23.1/23.2, CSA A3000, ASTM Section 4 Volumes 04.01 and 04.02 as well as ACI Manuals of Concrete Practice for differences between Canadian and U.S. Standards. Fly ash has many properties that improve the performance of concrete. Concrete made with fly ash tends to be harder, has less cracks, less porous, and gives off less dust. It also highly impermeable or very resistant to the ingress of water, chlorides, and oxygen. 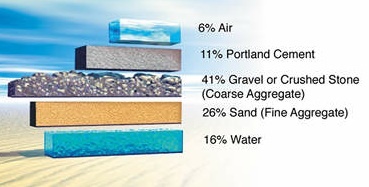 Fly ash reduces the environmental footprint of concrete. By replacing a portion of the cement used in the mix, fly ash reduces the green house gas emissions attributable to the application. 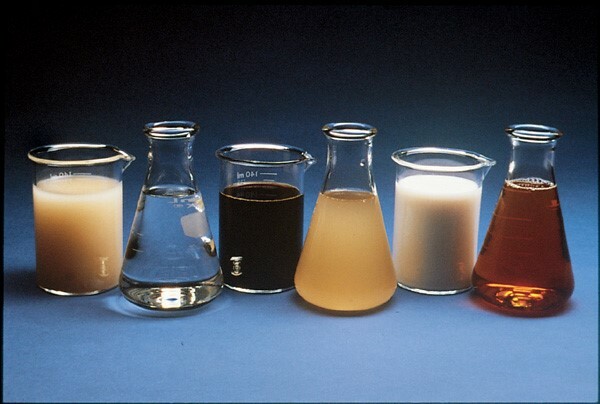 A number of chemical admixtures can be added to a concrete mixture to enhance the characteristics of concrete in both its plastic (before it sets) and hardened state. These chemicals contribute to the ease of transport, handling, placement and finishing of concrete and to the ultimate strength, durability, and lifespan of the finished product.